As its name suggests, Union City Public Library is located in the city of Union City, which is on the eastern edge of Randolph County, Indiana. The population served by the library is approximately 4,464 (2010 US Census, for Union City and Jackson Township, Randolph County, Indiana). 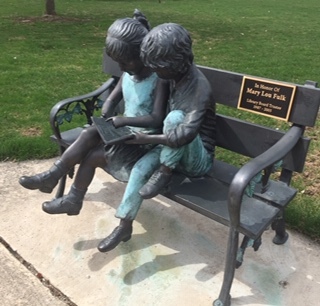 The library also provides a variety of beneficial services to the residents of the adjacent community of Union City, Ohio, located nearby just across the Indiana and Ohio state line. The Library got its inception from a society of young ladies that was organized April 23, 1887. Through their efforts, along with other community based literary and social organizations, the beginnings of a city library were established. In 1901 the Indiana State Legislature enacted a general library law which empowered communities to organize and maintain libraries for the benefit of the public, and following this, a Library Board was formally organized April 10, 1902, to help serve the 2716 local residents. By early 1903, because the library’s collection began to grow within the limited space where it was currently held in the second floor front room of the Wallace building on North Columbia street (it had originally started in the local school), a permanent quarters was needed. Toward this end the city owned four centrally located property lots that had been donated and designated as a public park and were reserved for a library building, but money was needed for establishing a new building on this empty 1.8 acre property space. To address this need, a grant for building construction funds was sought from Andrew Carnegie in the Fall of 1903. With a $10,000 approved grant, the start of the building became a reality in June of 1904. The Classical Revival building design was created by the regional architectural firm of Wright and Duncan, from Anderson, Indiana. It boasted a water fountain out on the front lawn, and two fireplaces, one in the south wing, the other in the north wing of the top floor. Construction was completed in May of 1905, and the building’s official grand opening and public reception celebration was held on June 8, 1905, with an organized program of instrumental (piano, and violin) and vocal musical recitals, as well as a poetry recital (the poem, “Little Orphan Anna”), a fine time was had by all. From the erecting of the building, only the upstairs level was used as a library space for the following five decades until 1961, at which time the basement storage area was renovated as the Children’s Services department, with meeting space. Throughout the years, improvements to the grounds and the interior of the building have been carried out. The biggest renovation took place in 1988 with the addition of an elevatorette and new stairs in the south entry of the building.